We propose an architecture of transition. A series of transitions between forces, (material) phases, people, spaces, and functions. Form does not always follow the functions that we cannot predict but rather the phases that our new built environments can go through in their relationship with humans, nature, and existing buildings. What our architecture may lack in a set style and goals is compensated in its ability to harness flows of energy and information in its various transitions. By treating our architecture as a homogenous system we give it the potential for infinite personalization based on control over specific spatial parameters. These parameters will define processes and reasons for change in architecture rather than finite and ultimately outdated states. Having said this, we cannot expect changes in our spaces and structures if the fundamental basis of architectural construction, the material, is still viewed as a sedentary element in our systems. A thorough understanding of smart materials and properties suitable for an adaptable architecture is therefore essential in gaining an understanding of their countless possibilities and limitations. In our studio project we have been working with Shape Memory Polymer (SMP) in order to apply it to a responsive architectural prototype. As our concept was based around the motif of architecture in transition, are using a material that can change phase from an external and controlled stimuli. Our SMP (Veritex) is able to reach a ‘soft’ and rubbery state upon exposure to heat above its glass transition temperature of 62°C, at which point it can undergo vast geometrical deformations. 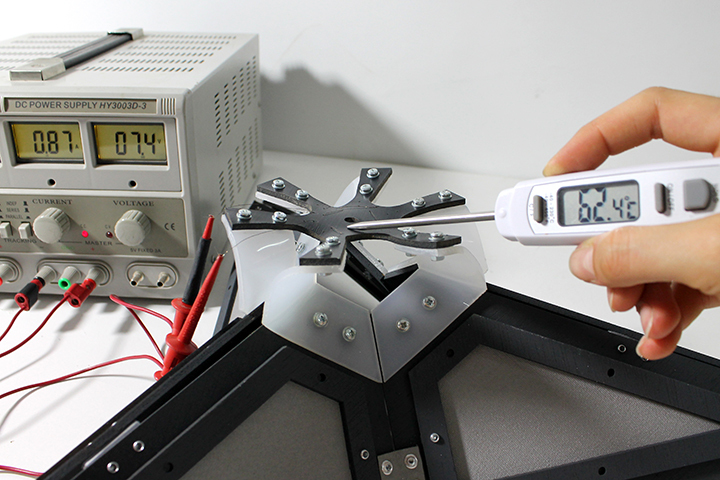 Therefore, by wiring and embedding our SMP with constantan heat wires we are able to pick and choose specific applications of heat to our prototype. After a deformation is made, the material cools and stiffens (within 2 minutes) to hold the new shape. 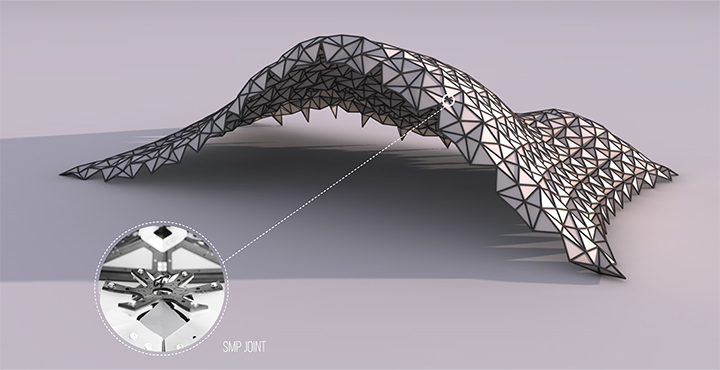 The use of SMP is minimized to perform as a structural joint in the material system of the geometry, that of a tessellated triangulated origami pattern. We place the laser-cut hexagonal SMP joint at the intersection of the pattern’s mountains and valleys to be able to control the overall geometrical deformations from these individual nodes. From the initial flat position of the homogenous structure it can be entirely heated and softened and then deformed into a desired position through the actuation force of pulling by many octocopter drones. 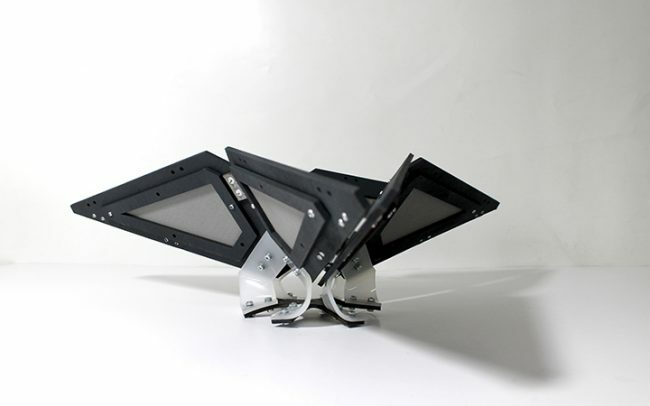 The drones hold the desired shape until the SMP cools, at which point the new form is held. This process can be repeated indefinitely, as the structure is able to respond to a given environment or user’s preferences for various spatial configurations, a never-ending transformable multi-purpose space. These transitions, whether they are ongoing, or frozen in a specific time or setting, define the evolving personality of our new built environment. 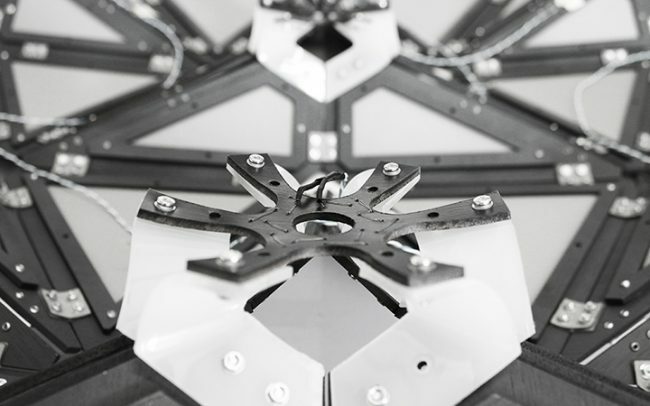 We decided that, to best suit our want for structural adaptability we needed to find a geometry that could arrive on site in an original state and then having the capacity to deform or expand into a desired shape from actuation forces. In addition it was determined that the concept would make most sense as a component of pieces that can be assembled to create a desired given whole. Therefore, a somewhat foldable structure was deemed to be able to give us this required expansion upon arrival on site, which is why we looked into rigid foldable origami patterns, namely that of origami pioneer, mathematician, and artist Ron Resch. Like Resch we started with paper, experimenting with various patterns such as the waterbomb, and magic ball, yet finally settled with the triangulated tessellation design, which gave us both great flexibility and original foldability. Our aim therefore is to interpret Resch’s work and develop his concept into that of a functional shape-shifting building, a self-supporting structure that, given its homogenous nature has the ability to expand, deform, and reshape over time. After numerous paper tests it was decided that it is the hexagonal nodes of the pattern that hold most control over the overall deformation of the geometry, dependent on their expansion or contraction. Once again, performing as a structural joint, the SMP is cut into a hexagonal shape and placed at these intersections of the pattern’s mountains and valleys. Apart from these SMP nodes, the rest of the folds are replaced by regular hinges, which act in tandem with the position of the panels around them. 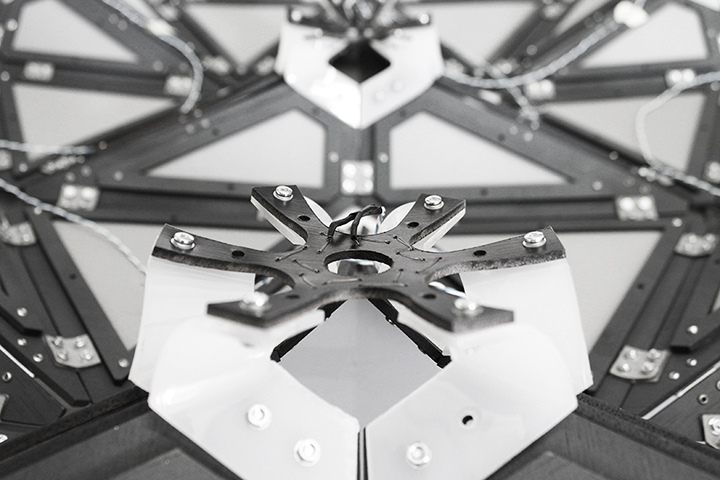 In the first prototype at 1:3 scale, we attach the hexagonal joint directly to the frames. Folding the entire pattern from a flat state proved to be difficult, however once in place the geometry was quite responsive to our needs. By heating the majority of the prototype and bringing the joints to a soft state we were able to successfully actuate growth in areas we wanted from inflating balloons underneath. The balloons fill out and push the geometry into place, and after cooling and removal of the balloon, the shape holds its new form. The concept of inflating through from underneath a real scale structure may seem difficult but it could be feasible with a system similar to that used in building binishell domes, albeit easily transportable. The second final prototype is an attempt to push the concept to a functioning 1:1 scale, shown with a cluster of 7 units. The key design feature in this prototype is the introduction of a buffering wedge in between the SMP joint and the triangulated panel. The wedge’s function is two-fold: 1) firstly it acts to take most of the shape memory property of the material, as a result the SMP is in its original flat memory state when the component is at its most closed and acute angle. This means that reversion to the original closed triangulation state is embedded within the material system. While our SMP is not the optimum one, and we would have liked to cast it, it allows for this property to be taken advantage of with an SMP that is even more responsive. 2) Secondly the wedge introduces physical constraints in the opening / closing of the modules as when it reaches to furthermost open state the wedges push against each other and limit any further movement. In our prototype the heating is applied uniformly across through a parallel circuit connected to the embedded heat wires, which worked well, however we propose a much more advanced system for the vision of the component in the grander scheme. 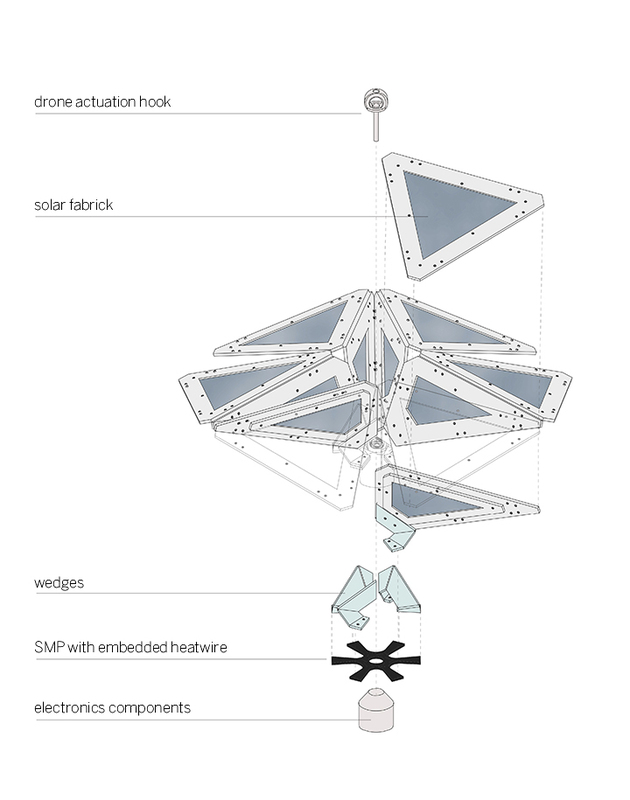 We envision each triangulated component to be a self-containing unit, housing a small battery and wirelessly controlled microcontroller housed in an electronics component attached to the underside of the panel, which are powered by the solar fabric embedded in the equilateral triangles surrounding the middle component. In this way we create a self-sustaining unit that can be controlled individually and remotely, without any need for wiring between units. Given that the it is the chosen assemblage of units that determined the original form and scale, one is free to design any desired grouping of components. Micro energy production occurs at every node of the structure and each local release of energy through heating of the SMP with heat wires informs the global deformation of the structure. The actuation for the deformations is achieved through the force of pulling by many octocopter drones. Why drones? 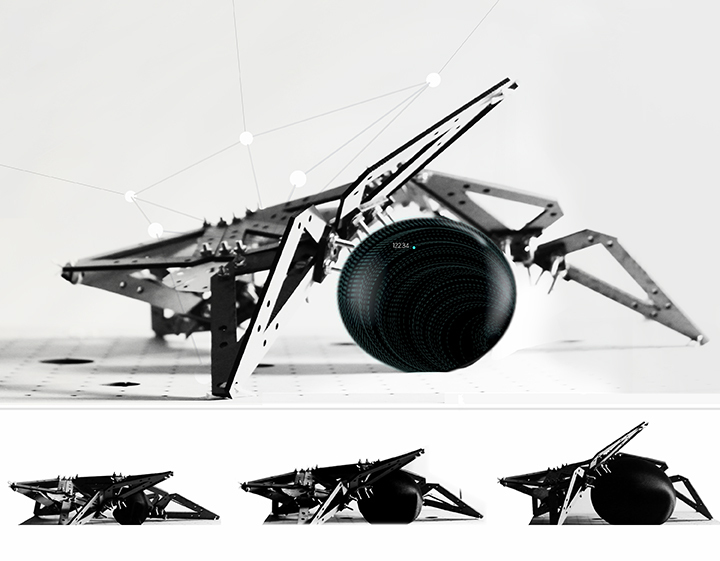 They are the perfect mobile scaffolding system and represent a new breed of artificial intelligence that can both be pre-programed or have the ability to learn based on specific parameters or act in a swarm fashion. 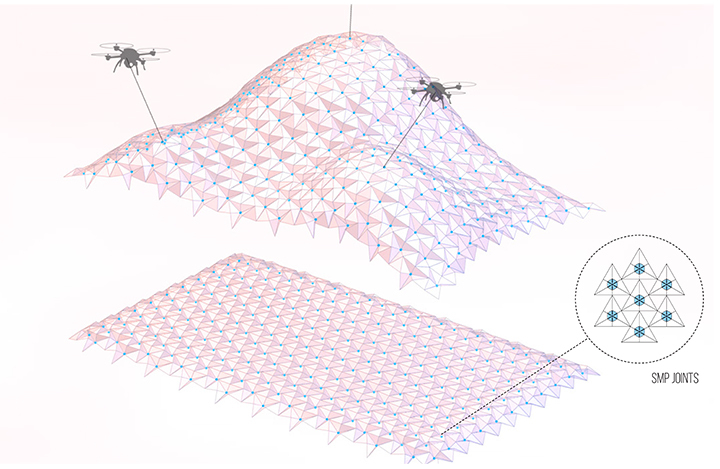 From a flat position where the entire structure is heated the drones pull at specific points and raise the structure into the desired place, upon which holding until the SMP cools, at which point the new form is held. The drone, either controlled by human or responding to specific environmental parameters, is also able to communicate with the microcontroller of each unit that is to be heated, establishing a communication between local nodes and global intentions. This process can be repeated indefinitely, as the structure is able to respond to a given environment or user’s preferences for various spatial configurations, a never-ending transformable multi-purpose space. These transitions, whether they are ongoing, or frozen in a specific time or setting, define the evolving personality of our new built environment.